The Independent School Entrance Examination (ISEE) is utilized by independent and magnet schools throughout the U.S. to determine entrance eligibility for prospective students. There are ISEEs designed for students from elementary to high school and the ISEE Upper Level exam is intended for students currently in eighth to eleventh grades who are seeking to enroll in schools for their ninth to twelfth grade years. When Can I Take the ISEE Upper Level? 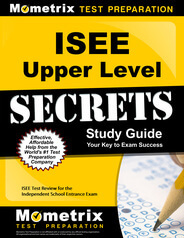 Prepare with our ISEE Upper Level Study Guide and Practice Questions. Print or eBook. Guaranteed to raise your score. Get started today! Participants are permitted to take the ISEE Upper Level as many as three times in a year and once each during three four-month periods. If a participant is seeking to enter ninth grade via the ISEE Upper Level, their first chance to do so would in the second semester or over the summer of their seventh-grade year. They would then be eligible to take the ISEE Upper Level again during their eighth-grade year in their first semester. Their last chance to take the ISEE Upper Level would then be in the winter of their eighth-grade year. How Can I Register for this Upper Level Entrance Exam for Independent Schools? Prospective participants for the ISEE Upper Level can be registered by their parents online. Registration is available through the Educational Records Bureau (ERB). During registration, a variety of available dates, times and testing locations — typically a private school that has partnered with ERB — will be available. Registration costs about $100 to $150. How Is the ISEE Upper Level Administered? The ISEE Upper Level is typically administered as a paper and pencil exam, but is sometimes offered on a computer. Participants are not permitted to bring scrap paper, calculators, rules, protractors, dictionaries, cell phones or other electronic devices to the exam. How Is the Content on this Upper Level Independent School Entrance Exam Divided? A grade-level appropriate prompt for participants to write a response to. This section is not graded as the others are, but sent directly to the school to which the participant is applying. How Will I Receive My Score on the ISEE Upper Level? ISEE Upper Level Flashcards. Proven test flashcards raise your score on the ISEE Upper Level test. Guaranteed. An ISEE Upper Level score is available on ERB’s website seven days after the test is scored. For an extra fee, it is possible to receive an expedited score. Schools to which a student may be applying will only see the scores that are submitted by parents and usually parents select the best single score that their children achieved. Rather than receiving a “passing” or “failing” score, a participant’s ISEE Upper Level score will be considered successful if it is high enough to get them into the school to which they are applying. That will be determined by the individual school to which they apply and its standards for admission. How Can I Achieve a Great Score on the ISEE Upper Level? Because the ISEE Upper Level tests participants on their knowledge regarding a full range of academic subjects, it is recommended that those preparing for the exam spend time reviewing a tailor-made study guide as well as a set of specialized flashcards. 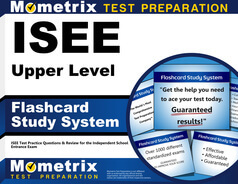 Solutions such as Mometrix Test Preparation’s flashcard set and study guide give ISEE Upper Level participants the tools to adequately prepare and achieve a score that sets them on the best path for their high school careers.